Great Autumn Package for You! Liptovský Mikuláš, apartments in a hotel-type apartmenthouse in a recreation area. In the accommodation facility there is: restaurant with terrace, cofee bar, children playground, conference room, game room (billiards, table tennis), wellness centre, storage room for bikes and ski equipment, electrical fgootwear-drier. Parking - unguarded, free of charge. VIA Jasná Apartments - Great Autumn Package for You! 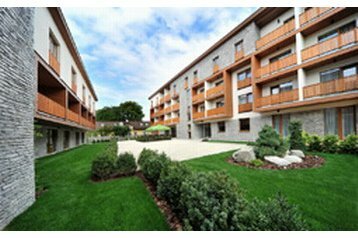 Via Jasná Apartment house is a perfect combination of hotel services within the apartment house. You can use the 4-star services and enjoy the spacious apartments or maisonette here. Enjoy the relax in the embrace of the Low Tatras in the Via Jasná apartment house. Experience two days so full of active rest, unique comfort, delicious gastronomy and pleasant wellness. Discover the beauty of Jasná! Bonus - children under 11,99 years - free accomodation!